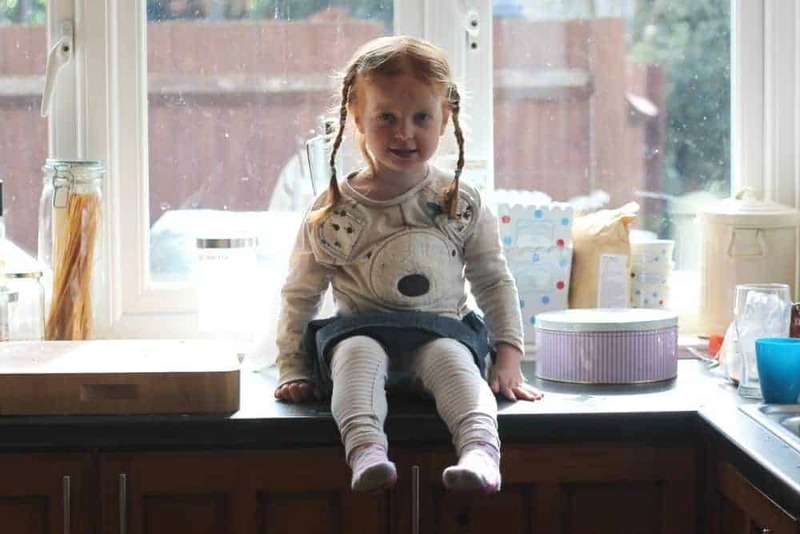 LP has a new favourite place in our kitchen – sitting on the worktop. This all started when we needed to wash her hands at the sink and we’d sit her up there and wipe her hands and face over rather than having to crouch down. From there it has become LP’s favourite place to sit. Whenever we finish a meal LP will wander over to the sink and ask to sit on the side so we can wash her hands and face but she’ll then start pointing things out – things on the sides of things she can see out the window in the garden. She loves to look at new things or just get a new perspective on the things she has seen hundreds of times before. LP also loves to sit up on the side whilst we’re cooking. She’ll sit while I cut vegetables, or while I put things together for lunch and she’ll talk to me all the time, about what we’re doing, what we’re doing later or what else she has done that day. Having my little worktop hog is something new to both of us. She likes the ‘grown up’ feeling of being allowed to sit somewhere previously out of bounds, somewhere she has to be careful and somewhere that feels like a treat. I love being on the same level as LP, being able to see her so easily when we’re doing things and have her watch what I’m doing from such a good angle. Before long LP will be a teenager, pushing herself up to sit on the counter whilst we make a cup of tea or talk about our day. For now she is an excited three year old with a new place to sit. Oh now there’s a happy little girl! Kitchen worktops are great for sitting on and swinging your legs, no wonder she likes her new vantage point! I did this as a child too, and I still find myself sitting up on the worktop chatting to my Mum when I go to her house! Aargh she is just too cute up there! I did this when I was a child too. For now M is too young, but I know he’ll love it when he’s eventually old enough and no longer a complete liability around any sort of kitchen stuff! I can imagine LP must love feeling like a big girl up there.